Blurb: When the TARDIS breaks down on the Roof of the World, Central Asia in 1289, its occupants are met by the explorer Marco Polo. His mammoth undertaking is to cross the desert to Peking, and before long he has set his mind on presenting the TARDIS to the emperor Kublai Khan as a gift on his arrival. Unless they can persuade Polo otherwise, the Doctor and his companions will lose their only means to escape this moment in history. Format: Television drama transmitted from February 22, 1964 - April 4, 1964. All 7 episodes are missing from the BBC archives. I watched the story as part of the Loose Canon series of telesnap reconstructions LC39 released in January of 2013. The BBC has also made available an audio CD of the audio, which was recorded by fans at the time with linking narration to explain any visuals lost on the audio. Disclaimer: The DVD cover above is in no way official and was made by Simon Hodges for use by fans such as myself who would like their telesnap recons to look like they fit in with the rest of the Doctor Who range. Setting: The Mongol Empire over a period of at least 30 days in the summer of 1289. (Since sometimes several days pass between scenes it is impossible to tell the exact number of days that this story occurs over. It happens over at least 30 days could have taken far longer. Locations visited: The Himalayas, the Plain of Pamir, Lop, the Gobi desert, Tun-Huang, Sinju, a bamboo forest, Cheng-Ting, the summer Palace at Shang-Tu, and Peking. Continuity: Susan refers to the metal seas of Venus (see The Transit of Venus and Venusian Lullaby). Susan without any prompting states that she's 16 years old, debunking latter day fan theories that she's in her one hundreds. The Doctor creates a new key to replace the one that was lost on Skaro (see The Daleks). A circuit breaks within the TARDIS at the beginning of the story likely due to the stresses that the Ship was under in the previous story although this is never stated (see The Edge of Destruction). DVD: Loose Canon pulled out all the stops on this one. 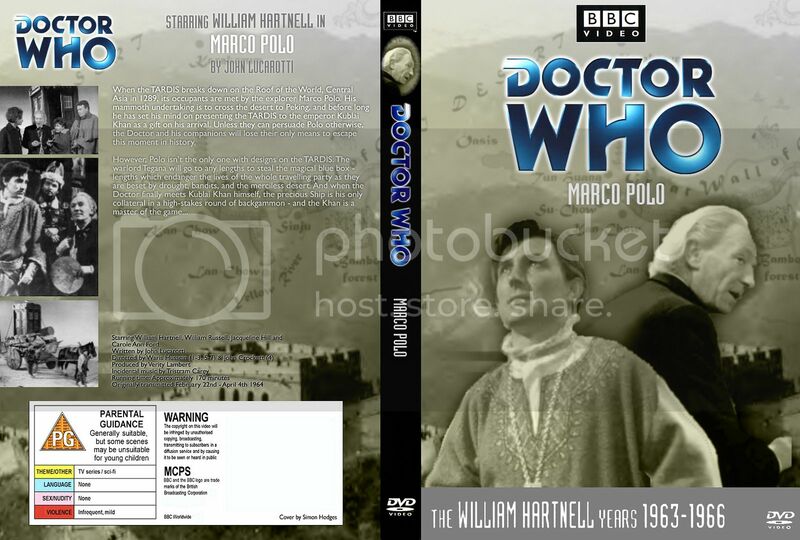 There are two short segments before and after the reconstruction with Mark Eden reprising his role as Marco Polo in the latter days of his life reminiscing about his experience with the Doctor. There's also an hour-long making-of featurette with interviews many of those involved in the making of this story. It's really almost as good as a BBC produced DVD. Discussion: I really feel as if I can't really get into the meat of talking about this story until I talk about the situation with the missing episodes. In the mid-70's the BBC decided that they were spending to much money on storage space for all the video masters that they had for many of their shows. The video tapes had to be kept at a precise temperature and their library was always expanding. They also felt that after 5 years, that a show had been sold to any overseas parties that were interested in it and no one would be interested in watching anything more than 5 years old. So, they went through their library of programs over 5 years old and started rating the shows with a letter 'A' through 'I'. 'I' meant destroy everything. 'A' meant save everything. Doctor Who got a rating of 'C' which meant preserve some episodes for historical purposes and junk the rest. Marco Polo was a victim of that action and to this day no one has discovered any of the 7 episodes even though it was probably the most sold story of those currently missing, since it was the fourth story and therefore got sold to a lot of countries that were interested in seeing what Doctor Who was about. In this day and age its still possible to enjoy Marco Polo in one of three ways. A novelization was made of this story as well as all but 5 of the original Doctor Who stories many years ago. In this case the author of the serial, John Lucarotti, also novelized it. The novelizations were intended for young adult readers and therefore tend to be short (usually between 120 and 140 pages) and so for an epic length story like this a lot was changed to make it fit into the format. The novelization is currently out of print, however, which might make things difficult if you wanted to use that method. The audio exists for all of these stories, taped by fans of the show on old reel-to-reel tapes. From these we have the two other methods to enjoy this story. One is through telesnap recons. In the days before commercial videotapes, sometimes directors would want records of their work so they would hire someone to take photos of the story as it progressed. Since there's movement involved with TV, this was a highly specialized business. The telesnaps for Marco Polo survive, so a group of fans called Loose Canon have taken the telesnaps and married them to the audio, in effect creating a slide show of the story with captions at the bottom for scenes that require explanation as to what is going on. The third method is audio CD's released by the BBC. These have the original audio for these stories with linking narration to explain anything that would require visuals. For the purposes of this review, I have watched the Loose Canon telesnap recon, LC39 (not to be confused with the earlier LC17 when less pictures from the story were available). If you wanted to describe Marco Polo in one word it would be epic. I am amazed with the sheer scope of this story, done on a shoestring budget in one of the tiniest studios available to the BBC. From the telesnap evidence and all first-hand accounts the costumes were beautiful and elaborate, the sets are fantastic - almost every story is a string of new locations meaning that the sets are never reused for more than 2 episodes, and the guest cast is amazing. Marco Polo is depicted evenly as a rational man, yet open-minded. Yet, in the end he's also a man that desperately wants to get home but has not been allowed to do so, setting up the central conflict with the Doctor. The Warlord Tegana is played with sinister charm. He does a great job of seeming to be a prideful warlord, showing disdain for the accusations leveled against him while plotting and conniving behind everyone's backs. Ping Cho gives Susan a fellow teenager to interact with, something that was completely missing from every other TV story that she appeared in. The scenes with Ping Cho help to give a depth to Susan's character as she discusses her desire for a home and discusses Ping Cho's upcoming arranged marriage with the girl. Kublai Khan is also a really interesting character. You expect to find an imposing warrior but instead he's depicted as an old man, sharp and cunning but also riddled with aches and pains and full of good humor. His depiction as a powerful administrator, ruler of the largest empire ever, but also old henpecked husband is quite amusing yet never strays into unbelievable territory. In these early days part of the remit of the show was to teach the children who were watching. Most of this story is set to teach kids about Marco Polo's journey and about some of the details of ancient China. Yet, the really fascinating part to me watching is that in a production where none of the actors are actually of Chinese or Mongolian descent it is all played very straight. There are no funny accents and even though the actors have been made up to appear a little darker and have their eyes slanted at the time the BBC just didn't have access to truly ethnic actors and actresses, which would have allowed this to be authentic. But ultimately with authentic performances given rather than comedy caricatures I think that its possible to still enjoy this story even with that in mind. I really like how the characters in this story are set up in trinities. The Doctor is set against Marco Polo and then in the final episodes he's moved to interact with Kublai Khan. His indignation against Marco who is ashamed of what he's done but also wants to get the Khan to allow him to leave so badly that he'll do anything makes for some great drama. In the final two episodes, the Doctor is paired with Kublai Khan. The two old men enjoying each others' company is hilarious and the backgammon game and its results is a lot of fun. Then we've got Ian stacked against Tegana with the two men both trying to reason with Polo. Tegana acts suspicious but Ian but the Doctor's actions make it difficult to reason with Polo who believes that the time travelers are also treacherous. The relationship between these three men is interesting and I love the scene where Tegana studies Polo playing chess with Ian and talks about his own view of chess as an exercise in mock war. I've already mentioned the bond between Ping Cho and Susan but Susan is also as ever partnered with her grandfather who is jealous of the influence that Ping Cho has on Susan and likely fearing that Susan will eventually want to leave him. If anyone is sidelined here, it's Barbara, who really doesn't get a lot to do except to get captured and rescued towards the middle of the story and point out historical facts on the way. The thing that really impresses me with this one is just how ambitious it was. It must have really tasked the resources on hand. We have everything from the icy steppes of the Himalayas, the desert complete with sandstorm, and a lush bamboo forest with bandit raids. When most people think about 60's Doctor Who they think about claustrophobic sets, but here we see what Doctor Who even in the 60's could be. In some ways its sad that the longer serials didn't get made more often as they allowed for a scope of story and character that wasn't possible in a 4-parter. It's interested that Disney approached the BBC about adapting this story into a film and while that fell through, the Doctor Who film that did get made was based on another 7-parter, The Daleks (that and its sequal star Peter Cushing as the Doctor and are adaptations of the first two Dalek stories). I really like this story because unlike other long stories that come later, it isn't a 4-part story padded into 6 or more episodes because they needed to fill airtime. This story was always intended to be 7 parts and its told in 7 parts so we get the scope required and a pacey enough plot in spite of the fact that its a long story. It's always kept fresh with new action and intrigue and the tension between the TARDIS crew and Polo is always kept fairly high, which keeps your attention. I can think of few of the early stories that are really this good. It helps that it has a writer who can give the characters lines of dialog that you'd think were lifted from Shakespeare. Recommendation: Fantastic. This story manages to blow the Daleks out of the water on everything but sheer sensationalist spectacle. I've always felt that human villains are the best because it doesn't sugarcoat what's going on. We understand the sinister aspects in the human psyche and there's no excusing it with alien motivations. This one is an epic that throws our travelers from one end of ancient China to another and always with the fate of the TARDIS in the balance. I definitely recommend that any doctor Who fans either watches the telesnap reconstruction or gets the CD made by the BBC.